Enjoy a taste of how the other half live in Big Shots. This 6 reel, 4,096 reel video slot has been created by Playtech and has a strong luxury feel. The highlights as far as gameplay is concerned are the oversized symbols that can reach 4×4 dimensions as well as a free spins round that only features higher value symbols. Play this high variance game on all devices from between 20p and £160 per spin. 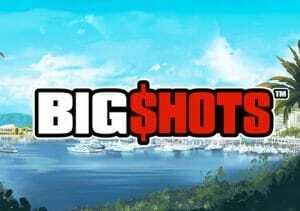 The setting for Big Shots is the secluded harbour of a beautiful seaside resort. You’ll see palm trees, luxury yachts and hotels in the background. On the reels are gemstone-style heart, diamond, club and spade symbols. More lucrative are the 5 human characters who look like they could have come straight out of an Ocean’s 11-style movie. There’s the girl in a hoodie with a laptop, the black guy in sunglasses, an older gent with goatee and a glamorous blonde. The best symbol is the man in the dinner jacket. Land 6 of this cool customer on adjoining reels and you’ll win an award 5 times your bet. There’s also a wild, the diamond, which replaces everything apart from the free spins scatter. Landing 6 scatters in combination will get you an award of 6.25 times your bet. All of the symbols can land in oversized formation rather than just as singles. The maximum size is a 4×4 square. You can create some big winning clusters thanks to these colossal symbols. The main feature is the Free Games feature which is triggered when the free spins symbol fills the whole of the middle 4 reels. If you just miss out, you could get a nudge to push it into place and trigger the feature. Once activated, you’ll be awarded 5 free spins. All of the heart, diamond, club and spade symbols are removed from play during this feature. With only higher value symbols spinning around the reels, there are excellent opportunities to land a big winning score. Those free spins aren’t the easiest to come by. We endured some lengthy winless spells. The Free Games feature offers some serious potential though. This is an extremely volatile video slot so tread carefully, especially if you’re nursing a limited bankroll. You can win 25,600 times your bet on every spin!